FUE or follicular unit excision is one of the methods for hair follicle harvesting in hair transplantation. FUE involves harvesting hairs from the donor area, under local anesthesia which is most commonly the scalp but occasionally beard, chest and other parts of the body, using a circular punch less than a mm, mounted on a manual handle or a motorized hand device or more recently a robotic device.First hair transplant was done by Dr Shoji Okuda in 1937. The term “follicular unit extraction” was coined by William Rassman in 2002. The modern era of FUE begins with the work of several surgeons Woods, Rassman, Cole, Harris and Rose. FUE has gone through various stages of development from manual to motorized and blunt to sharp, serrated trumpet and flared punches. Now the use of the robot in FUE with extraction and incision making is also in use.In 2017 nomenclature committee headed by Parsa Mohebi of ISHRS, recommended the term “FOLLICULAR UNIT EXCISION” is most appropriate as it explains the two steps of the process: incision and extraction and incision is done by a physician. FUE is a surgeon based time-consuming procedure with the long learning curve. Use of motorized device and sharp punches has certainly helped to increase speed in an experienced hand. FUE method of hair transplant is the most demanding procedure. If done properly it is a safe procedure. with the experience, use of better quality of instrument the disadvantages of FUE like transection can be reduced. The above informations were collected from various papers published in authentic journals and textbooks. FUE or follicular unit excision (hitherto called extraction) is one of the methods for hair follicle harvesting in hair transplantation., FUE involves harvesting hairs from the donor area, under local anesthesia, which is most commonly the scalp but occasionally beard, chest, and other parts of the body, using a circular punch less than 1mm, mounted on a manual handle or a motorized hand device or more recently a robotic device. The extraction leaves a circular wound or incision, which heals with primary healing, leaving only a tiny scar. The procedure has achieved increasing popularity as compared to FUT or follicular unit transplant, there is no long liner scar. First hair transplant in history was performed by a Japanese doctor, Dr. Shoji Okuda (1886–1962) in 1937, who published a paper in 1939 in Japanese Journal of Dermatology and Urology. Punch used by him was a metallic tube having two ends, one narrow sharpened and the other wider. He called it a round saw. This round saw punch was 1–5mm in diameter. Using this round saw, he harvested grafts and called them micro round skin flaps. These skin flaps consisted of all the layers of skin and the hair follicles. He then transplanted them onto the bald area. It is indeed remarkable that this work predated modern FUE by almost 65 years. The modern era of FUE begins with the work of several surgeons Woods, Rassman, Cole, Harris, and Rose. The term “follicular unit extraction” was coined by William Rassman in 2002. Dr. Paul Rose suggested the term “follicular isolation technique” (FIT) to denote the possibility that an extracted graft does not always include all the follicles of the follicular unit or at times include follicles from more than one follicular unit. Now the question is on the use of the word “follicular unit extraction.” Extraction in purest form can be defined as the action of taking out something using effort or force. Though the method minimized scar formation and hence found greater appeal among patients and new surgeons alike, it also attracted criticism as the method results in a greater transection of hairs and is time-consuming. Over the last 20 years, the focus has been on the incisional aspect to minimize transection rates and to enhance the speed of extraction. We have seen an explosion in the variety of incisional techniques using handmade punches from 18 and 19 gauge needles and sharp, serrated, non-serrated, dull, hybrid, U-punch, trumpet punches, and more. A variety of automated,,, devices also have evolved to assist with the speed of incisions, such as the S.A.F.E.R System, ARTAS, NeoGraft, SmartGraft, Vortex, PCID, WAW system, Atera, 3 Step FUE, RoteCore, Mamba, and other international devices. Now, robots are in use for FUE for follicle extraction as well as incision making. In 2017, a nomenclature committee headed by Parsa Mohebi of international society of hair restoration surgeons concluded that the term “follicular unit extraction” is inappropriate and misleading because it is a histological term rather than an accurate anatomical and surgical term. The committee recommended the term “follicular unit excision” as it explains the two steps of the process: incision and extraction. The term also carries greater surgical implication that this is a surgeon’s procedure and should not be performed by technicians. Follicular Unit Excision is the surgical technique that refers to circumferential incision of the skin around the follicular unit bundle or group of hair follicles for the purpose of extracting a full-thickness skin graft containing hair follicle(s), intradermal fat, dermis, and epidermis. The logic of FUE: As explained by a landmark paper by Headington,, the follicular unit comprises 1–4 hair follicles, their arrector pilorum muscle, surrounding connective tissue, nerves, and vessels [Figure 1]. The logic of FUE is to excise a column of tissue or a circular skin flap having hair and all layers of skin by releasing the fold of arrectores and by severing the adherence of surrounding dermal collagen through a circular punch. As the shape of the follicular unit is pyramidal, it is the narrowest in the upper part till the attachment of arrectores; hence, a small punch of less than 1mm is enough to excise the unit. This small size would then heal easily, quickly without a significant scar. The inferior segment of hair below the arrectores is temporary disappearing in telogen, it is loosely held and the unit pops up once the hold of arrectores is released. Such grafts would not then need any further dissection and hence are ready to be placed in recipient holes. However, the pyramidal shape of the unit with splaying of hairs in the lower segment and the varying level of attachment of arrectores would also lead to greater level of damage of the hairs, particularly because the introduction is blind and no visualization of the unit or the muscle is possible. 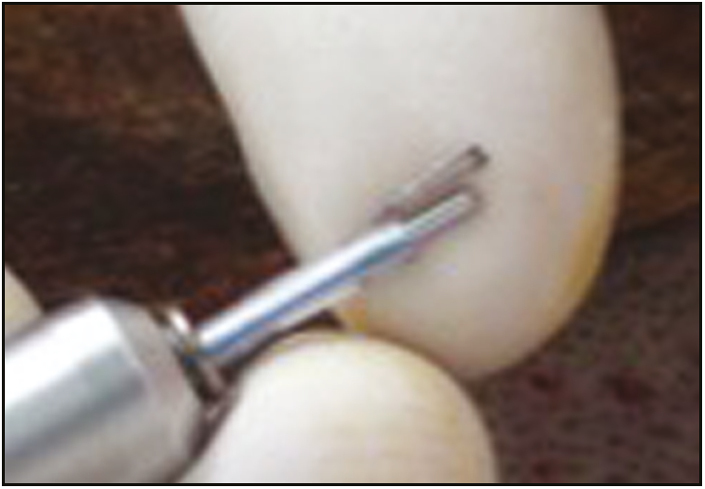 An accurate insertion depth is the main key for a good and successful FU extraction. Hair is firmly attached to the tissues it is surrounded by. This tethering is probably the major factor explaining the broad range of results obtained with the different FUE techniques and the variation from patient to patient. The tethering is linked to the existence of various lateral connections between the dermal sheaths, the sebaceous gland, the arrector pili muscle, and the connective tissue of the surrounding hypodermis. There is also a deep tethering between the hair follicle and the subcutaneous fat tissue at the bottom of the graft (vessels and surrounding tissue). To have a good smooth extraction, you need to cut the majority of the lateral attachments. Consequently, the vertical force required to extract the follicle will be small enough to avoid injuries linked to the traction (such as capping, splitting, crushing, breakage, or worst overheating). The only way to cut attachments is to cut deep enough. Deep enough means for the majority of cases, you need to use two forceps to extract: one pulling the graft and other simultaneously pushing the skin the opposite direction. If you can remove the graft with just one forceps, it means you went too deep with the punch. Normally if the dissection is good, grafts just pop up, no need of double forceps, just the level of scoring should be perfect. There are exceptions. Sometimes, in an easy case, it is possible to remove the graft without a contra force, just by pulling, even if the scoring was shallow. One of the challenges in FUE donor harvesting is the variability of the FUE donor area. The viscoelastic properties of the skin are important in FUE donor harvesting and contribute to the unpredictability of donor harvesting. 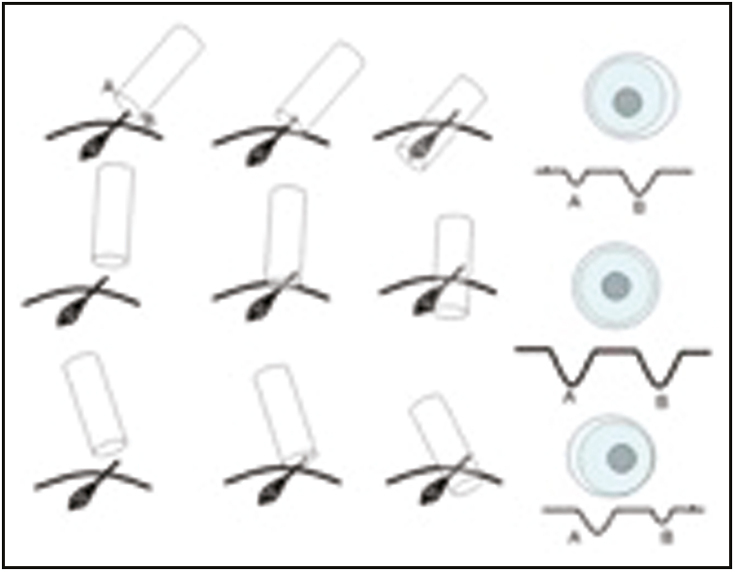 The tissue characteristics of skin vary from one patient to another, and the skin’s viscoelastic characteristics impart biomechanical properties similar to the elastic properties of solids and viscous properties of fluids. The patient-to-patient variations in the epidermis, dermal–epidermal junction, and subcutaneous tissue contribute to the challenges of donor harvesting and obtaining low follicular transection rates. FUE is a time-consuming surgery that requires focus and experience. So the best way to begin is to plan small sessions with realistic goals. This way, the surgeon can take the time to observe, adjust, and learn with the eventual mistake made, without additional stress. It is advisable to plan your first session of only 400–500 grafts, keeping in mind that the extraction time may be almost the same as the insertion implantation (and the total must be less than 8h). Another important issue is good patient selection: a collaborative relationship, preferably with a small recipient area, straight and thick hair, and realistic expectations (keep expectations low). The less movement you make, the less the risk of damaging the follicle. In motorized extraction, the movement is rotatory; on the other hand, the movement of the punch used manually is oscillatory. The deeper the punch goes, the more it releases the follicle from its ties. So the follicle then has the annoying tendency to twist on itself around its deep ties, ending in the worst case with the whole follicle being drawn into the deeper dermis. This is called a “buried graft.” Buried graft is more commonly seen with manual punch. This is most commonly seen with a motorized punch in inexperienced hand. The major advantage of oscillation of a manual punch is avoidance of complete twisting of the follicle. Another advantage of manual extraction is that surgeons feel the tissue resistance when they enter the different density of tissue plane starting from epidermis, dermis, and subcutaneous tissue; as per tissue resistance, they can adjust their force and movements. So for beginners, it is advisable to start with the manual extraction. But the biggest limitation is the speed of extraction. The motorization has almost solved the speed problems with the advancement of speed control, oscillation, and changes in torque, and so on. The SAFE System was developed by Harris,, which uses “blunt” instrumentation to dissect the follicular units from the skin minimizing the risk of follicle transection. The technique uses either a two-step manual dissection technique or a one-step powered dissection. 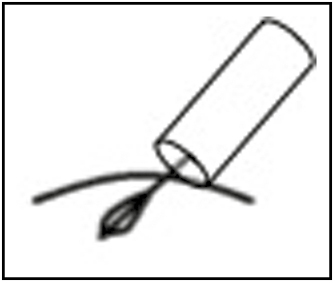 The manual technique involves the creation of a 0.3 to 0.5mm depth “scoring incision” around the follicular unit by sharp punch followed by the insertion of a blunt tapered “dissecting punch” to its full depth (approximately 4mm); the graft is then removed from the skin. The blunt tip allows the separation of the repetition from the surrounding tissue and facilitates the “gathering” of splayed follicles into the lumen of the punch. This reduces follicle dissection as well as solves the problems of tethering but speed is its limitation. The single-step powered drill with a dull punch increases the speed. Harris introduced the dull Hex punch. The shape of punch improves the dissection of follicles from surrounding tissue. The dull punch on a motor reduces the transaction and improves the speed. The potential problem associated with dull punch is the increased incidence of buried grafts, and the speed of extraction in comparison to sharp is slow. Dr. John Cole has been promoting sharp punches for a very long time and he has beautifully simplified the biomechanics of extraction to support his theory. When force is applied over the skin to cut, then there is compression of skin and follicle underneath it as one unit. To cut using a dull punch more force is needed, this leads to more distortion of follicles and skin, leading to more chances of the transection and more buried grafts. If the sharp punch is used, less force will be required to cut the skin so there will be no or minimal distortion of this skin follicle unit. He extended his concept further by mentioning that, the contact surface of the punch to the skin shall be reduced to decrease the frictional injury to tissue, so he designed the serrated punch, which reduces the contact of the sharp edge area to the skin. Another example is Dr. Jose Lorenzo who uses titanium sharp punches manually for extraction. With a sharp punch, the potential problem is increased transection rate, which is an important aspect and should be taken care of seriously. But with practice, precise depth control and accurate size of punch transection can be reduced. When we want to cut skin, we need a sharp punch and to dissect follicle from surrounding, we just need a dull punch. The flat punch mechanics does exactly the same. At 90degree, flat punch acts sharply to the skin but after piercing, it acts like a dull punch. By using a flat punch, we can penetrate deep enough without damaging follicle. The concept of flared, trumpet, and flat punch is almost the same. Diameters of punches available are ranging from 0.7 to 1.2mm. Most commonly used is 0.9mm for scalp and 0.7–0.8mm for body hair follicle harvesting. The larger size of punch will reduce transection but with more scar volume and greater vascular compromise of the donor area. At the same time, if the diameter is reduced, it may increase transection, will give thinner grafts, fewer follicles per FUs, but reduce donor scar volume. Theoretically, if punch diameter is reduced by 10%, for example, from 1mm to 0.9mm, the area is reduced by 19%. Thus, if there is a 10% difference in punch diameter, the possible number of extractions is reduced by 20%. Length of punch is also important in relation to transection of follicles, vascular injury, and de-capping of follicle. If length is more, there are likely chances of increased complete and/or partial transection and more injury to underlying vessels, causing oozing of blood during follicle harvesting. The best way to control the depth is use of guard over punch. First do few test follicles harvesting and take length of follicle. Then, use a guard, which you can make by a small piece of infant feeding tube. Adjust the guard length to the extent that depth of punch reaches just above the bulb of follicle. If depth of punch penetration is less than the follicle, removal will be difficult and may cause de-capping and/or injury to follicles. Most common advice for FUE beginners is first they should visit a surgeon and see a few cases and discuss them. Read the procedure in detail to understand the basic science behind the technique. Start with manual punches and then with motorized punches. First, take small cases or you can practice on a strip of FUT before harvesting it. Step I: Aim of FUE is to achieve zero transection. The question is how to achieve it? The angle of the exit of hair should be the same as the angle of insertion of punch. This we can achieve by practicing the “scoring technique.” Scoring technique needs magnification. Higher is better, preferably 4× magnification with a very good quality loupe. Hold the manual punch or motorized hand firmly as you hold a pen. Then stabilize your hand, concentrate on the angle of hair, and engage the hair, keeping the hair shaft and infundibulum of hair in the center of the circumference of the punch and the punch parallel to the hair shaft [Figure 2]. This is called engagement. Then gently advance or penetrate the edge of the punch just enough to score the skin. Score at least 10 hairs and then check for centralization of hair and analyze the score characteristic as shown in [Figure 3]. Analysis of score: Analyze your scoring as shown in [Figure 4]. If point B is deeper than point A (as shown in [Figure 4]), it means the punch is parallel to the hair shaft and the hair is in the center of the score. So, the follicle has not been transected. Hence, this scoring analysis technique will give an idea if there is transection or not. Punch depth control: To prevent the transection, it is extremely important to control the depth of penetration of punch. If we go deep up to the level of bulb using sharp punch, there are more chances of the transaction and if we remain superficial, then it will be difficult to extract graft and there will be more de-capping or de-sheathing. So, the use of guard over punch will control the depth of penetration of punch. Keep the length guard so that punch depth remains just above the bulb of hair follicles [Figure 5]. You can take five test grafts to see the length of the follicle. After the engagement, rotate the punch gently and advance or penetrate the scalp keeping the same punch angle. Once you reach the desired depth, then stop the rotation and take out the punch. How many follicles can be extracted? For safe excision density,, we must first consider donor area limitations and avoid excising from areas likely to be affected by androgenetic alopecia. This usually means excluding the nape of the neck, superior lateral fringes, and the superior aspects of the occiput near the regions of the balding crown. Most FUE experts recommend 10–15 excisions/cm2 as a safe single pass density in a person with a baseline average density of 65-75 follicles/cm2. Dr. James Harris and colleagues reported a routine use of higher excision density in the range of 20–25 without problems. In the case of a patient with an average baseline density of 70 follicles/cm2, an excision density of 10–15 leaves a residual FU donor density of 55–60. A second pass FUE surgery with the same excision density would further reduce residual density to 40–45, and the third pass to 25–30. Visible thinning may be expected in the latter case, but it could also appear at a residual density between 40–50 follicles/cm2, particularly when hair shaft diameter is low, contrast is high, hairs are straight, and the hairstyle is short. For mega sessions, with more and more experience of FUE, sharp punches, and more sophisticated devices, a large number of follicles can be harvested in one session of hair transplant. When we extract 2000–2500 grafts in one session then it is called mega session,, and if extraction limit is more than 3500 or 4000 grafts in one session, it is called as giga session. FUE is a surgeon-based time-consuming procedure so fatigue is a very common feature. To avoid fatigue, it is advisable to do multiple small sessions of extractions and implantation. Frequent breaks with regular fluid intake can reduce the fatigue. The surgeon should also do regular exercise to strengthen neck, back, and forearm muscles. The position of the surgeon as well as the patient should be very comfortable, for easy and safe extraction. Thai message chair or modified dental chair, prone, and lateral position with frequent change of position will give maximum cooperation from patient. It is very important to have safe, smooth, and painless anesthesia. The technique of giving local anesthesia should be least painful. Use of fine bore needle, vibrators, sedation, wheel technique, slow infiltration speed, prilocaine gel, ice packs, field blocks, nerve blocks, and field blocks over the area before infiltration are few steps, which reduces pain while giving anesthesia. The speed of follicle extraction is an important aspect in FUE, but it is very important that speed should not be increased at the cost of follicle safety. The speed can be achieved with experience only. Other factors are instrumentations, patient and surgeon’s comfort level, and smooth local anesthesia. Immediate implantation, graft ischemia time, or graft out body time, certainly affects hair growth in terms of quality and quantity. To reduce graft outside body time, simultaneous or immediate follicle implantation is done., This can be carried out in two ways. One is graft implantation, in premade slit and graft, extraction is carried out all together. Another way is to extract a few grafts and implant them immediately. Attempting a case size that is too large for your experience level. This creates too much pressure to get grafts out at any cost and thereby compromising graft quality. Inexperience with the device or technique being used. Train with an expert in the technique you choose and practice before signing up patients for surgery. Improper level or quality of magnification used for the dissection. Obtain high-quality surgical loupes of at least 3.5× magnification. Not recognizing the fragility of FUE grafts and using the same handling protocols used with strip grafts. Precisely control the depth of punch by a guard. Do not hurry for extraction and in between check for your transections and modify your technique. If FUE is not carried out properly then there are chances of many complications. If surgeon is not experienced in FUE, the first and most common complication seen is high transection of harvested follicles and also of remaining nearby donor follicles. This reduces the available healthy donor hair follicles. Another is overharvesting leading to thinning of donor area, see through scarring, chances of necrosis of donor skin, and donor area hair follicles’ shock loss. If follicles are not harvested from safe donor area, the implanted follicles will be lot in future. The FUE procedure does not require a big team and expensive instruments and machine, giving a false perception of “an easy procedure,” thereby getting adopted by less trained physicians and sometimes technicians, leading to a very high rate of complications. If FUE is performed by a well-trained physician, it is a very versatile procedure and most commonly accepted procedure for hair transplant. The physicians who are from nonsurgical field can learn it and do it very well, it does not require a big team of assistants and comparatively a big operative setup. FUE harvesting of follicles has opened a new era of follicle harvesting from non-scalp donor area commonly called as “body hair transplant.” The most common advantage of FUE, which is liked most is that no long liner scar is reported, which allows patient to have short hair. The disadvantage of FUE is that it has a long learning curve and its needs more of the physician’s time as compared to strip harvesting or FUT. Our principle ethical consideration when performing any type of cosmetic procedure is primum non nocere (first, no harm), and in our field, this revolves around the selection of appropriate surgical patients, setting realistic goals with patients, discussion of appropriate medication options, and an appropriate number of grafts safely harvested without donor compromise. The perceived wisdom of a less invasive procedure has overwhelmed the reality of the long learning curve required to pursue skilled FUE donor harvesting. The provision of better technology (better punches, newer hand engines, suction-assisted harvesting, and even robotic machinery) has not materially lessened the skill or the learning curve required. FUE remains a precisely skilled harvesting technique that is physically demanding (excluding the robot) on the physician. The need for significant “hands-on” training has never been greater but at present cannot (and will likely never) be met. This results in many physicians “learning” this technique in their paying patients with many patients suffering from suboptimal outcomes. Another unfortunate aspect of FUE is delegation of follicle harvesting to technicians, which is unethical. This is a serious issue for which all physicians should understand the long-term disadvantages of delegating of follicle harvesting to technicians. The FUE is a surgical procedure and shall be done by a trained physician only. Surgical planning of the donor area should, therefore, be conservative to increase the likelihood of long-term survival of grafts. If we are going to harvest nearer the balding margin in young men, as many surgeons do to preserve the evenness of density reduction, we must be honest about the increased risk (compared to strip) of future balding encroaching into the harvested donor areas and the resulting loss of grafts together with potential visibility of donor scarring with lower quality punches. We would like to thank Dr. Venkataram Mysore for his valuable guidance and support. Bernstein RM, Rassman WR, Szaniawski W, Halperin A. Follicular transplantation. Int J Aesthetic Restorative Surg 1995;3:119-32. Bernstein RM, Rassman WR. The aesthetics of follicular transplantation. Dermatol Surg 1997;23:785-99. Poswal A. Body hair transplant: an additional source of donor hair in hair restoration surgery. Indian J Dermatol 2007;52:104-5. Inui S, Itami S. Dr. Shoji Okuda (1886–1962): the great pioneer of punch graft hair transplantation. J Dermatol 2009;36:561-2. Rassman WR, Bernstein RM, McClellan R, Jones R, Worton E, Uyttendaele H. Follicular unit extraction: minimally invasive surgery for hair transplantation. Dermatol Surg 2002;28:720-8. Kingsley S. Sharing experiences of follicular isolation technique? Follicular unit extraction. Hair Transplant Forum Int 2004;14:15-6. Rassman WR, Bernstein RM. Automation of hair transplantation past, present and future. In: Harahap M, editor. Innovative techniques in skin surgeon. New York: Marcel Dekker; 2002. pp. 489-502. Serdar G, Nessin B, Gurcan A. Follicular unit extraction in hair transplantation: personal experience. Ann Plast Surg 2008;60:127-33. Ekrem C, Aksoy M, Koc E, Aksoy B. Evaluation of three instruments used in FUE. Hair Transplant Forum Intl 2009;19:14-5. Bernstein RM, Rassman WR. New instrumentation for three step follicular unit extraction. Hair Transplant Forum Int 2006;16:229-37. Ricardo M. Redefining the “E” in FUE: Excision = incision + extraction. Hair Transplant Forum Int 2018;28:5-6. Headington JT. Transverse microscopic anatomy of the human scalp. Arch Dermatol 1984;120:449-56. Jimenez F, Ruifernández JM. 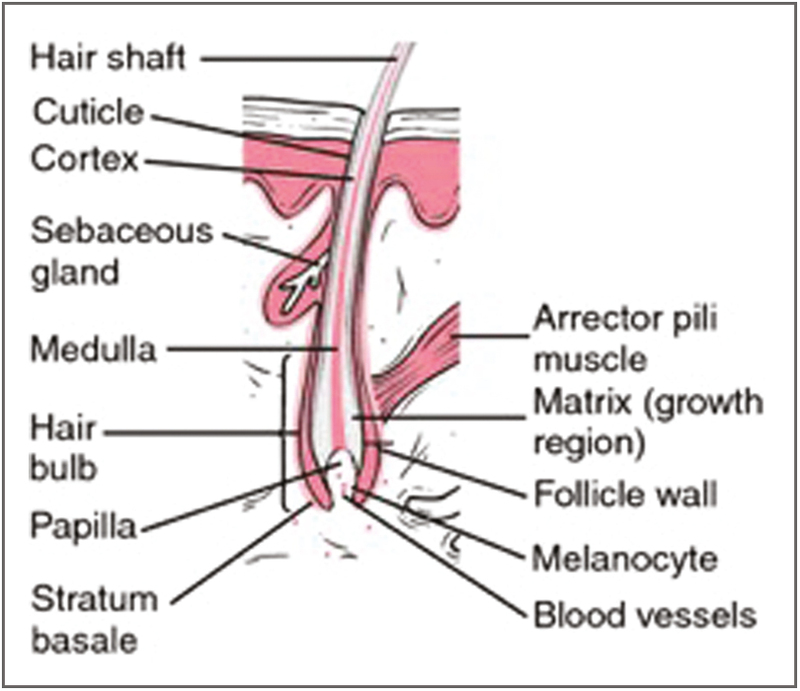 Distribution of human hair in follicular units. A mathematical model for estimating the donor size in follicular unit transplantation. Dermatol Surg 1999;25:294-8. Harris JA. Conventional FUE. In: Unger, editor. Hair transplantation. 5th ed. London, UK: Informa Health Care; 2011. pp. 291-2. Harris JA. The SAFE System: new instrumentation and methodology to improve follicular unit extraction (FUE). Hair Transplant Forum Int 2004;14:163-4. John Cole. Commentary: donor area harvesting. In: Unger, editor. Hair transplantation. 5th ed. London, UK: Informa Health Care; 2011. pp. 296-8. Keen SA, Rassman WR, Harris JA. Determining safe excision limits in FUE. Hair Transplant Forum Int 2018;28:8-10. Devroye J. Donor area harvesting. In: Unger, editor. Hair transplantation. 5th ed. London, UK: Informa Health Care; 2011. pp. 247-8. Bernstein RM, Rassman WR, Anderson KW. Follicular unit extraction mega sessions: evolution of a technique. Hair Transplant Forum Int 2004;14:97-9. Onda M, Igawa HH, Inoue K, Tanino R. Novel technique of follicular unit extraction hair transplantation with a powered punching device. Dermatol Surg 2008;34:1683-8. Ors S, Ozkose M, Ors S. Follicular unit extraction hair transplantation with micromotor: eight years experience. Aesthetic Plast Surg 2015;39:589-96. Miao Y, Fan ZX, Jiang W, Hu ZQ. Patient in the sitting position to improve comfort in follicular unit extraction. Plast Reconstr Surg Glob Open 2016;4:e1141. Swinehart JM. Local anesthesia in hair transplant surgery. Dermatol Surg 2002;28:1189. Limmer R. Micrograft survival. In: Stough D, Haber R, editors. Hair replacement. St. Louis, MO: Mosby; 1996. pp. 147-9.